Flexiducting are New Zealand distributors of a complete range of Thermal Protective Sleeving for Hose protection and Cable protection. Our protective sleeving range includes: Silicone coated fibreglass fire sleeving; Fibreglass heat sleeving; High temperature Silica fire proof sleeving; Braided stainless steel sleeving & Interlocked stripwound metal Sleeving. Our large stockholding of thermal and protective sleeving assures our customers instant delivery. Whether you are after full box quantities or cut lengths – we have it for you. Silicone fire sleeving is aerospace grade manufactured in compliance with the AS 1072 in sizes ranging from 6 mm to 127 mm ID. Silicone aerospace grade sleeving has a temperature rating of 260°C continuously and will withstand a molten splash at 1200°C. The silicone sleeving is resistant to all oils and most chemicals. Silicone tape is designed to seal the ends of the silicone fire sleeving. It has the same physical properties as the silicone aerospace grade sleeving – they will bond together when applied. Rolls are available in 25 and 45 mm widths. Alternatively you can attach sleeving with our crimp rings. 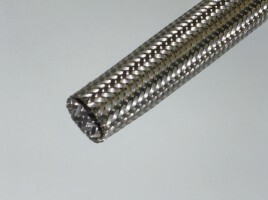 These crimp rings are also commonly used to crimp industrial end connections to industrial low pressure hose, and diffusion sleeving retainer rings on hydraulic hose assemblies. We have a vast selection of rings available to cover all hose sizes. Please refer to our catalogue for sizing. 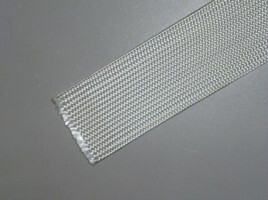 Silica braided high temperature sleeving is made out of 96% pure SiO2 braided silica fibre. Silica sleeving has a temperature rating of 982°C continuously and will withstand short term exposure up to 1650°C. We stock from 6 mm to 38 mm ID, with larger sizes available by special request. 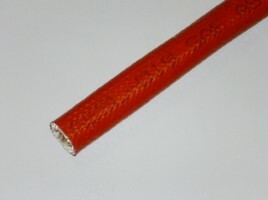 Fibreglass braided heat sleeve is an economical form of hose and cable protection, where exposure to molten splash, oils or moisture is not a factor; it is constructed of high quality type E glass. Fiberglass sleeving has a temperature rating of 540°C continuously where the fibreglass will not burn. We stock from 6 mm to 127 mm ID. Stainless steel braided sleeving and stainless steel interlocked stripwound sleeving: Both products are ideal armouring for hydraulic hose, industrial hose and electrical cables – without losing any flexibility. We have a size for every hose and cable – just contact our sales staff or find the popular sizes in our literature.